At the July meeting, Judith Walker, the President, introduced visitors from Bearley and Sue Musson from County. Judith also reported that the Village fete had raised approx. £3000, which will be distributed amongst village concerns. The WI stall raised £130 with the sale of homemade marmalades, jams and chutneys, together with various hand crafted items. Judith had enjoyed her visit to the AGM in Liverpool, together with 4500 other members of WI from the whole country. She enjoyed singing Jerusalem and listening to some very interesting speakers . Of the resolutions, the one about saving libraries was supported almost unanimously, but the mega farms resolution was thrown out, because there was too much controversy about the wording. In 2015 WI will celebrate it`s Centenary. 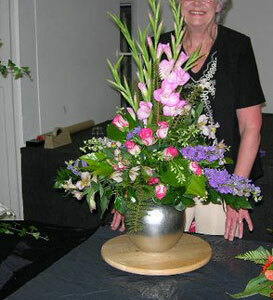 Barbara Shepherd, the speaker for the evening, created three beautiful arrangements of flowers. The first she called contempory and was composed of all white lillies and a new variety of chrysanthimum. Barbara grows most of the greenery she uses, such as fatsia, choisya, alchemilla mollis and camellias. The second was a more traditional table arrangement. In fact, it was two almost identical pieces, which she called "Mother and Baby". The colour scheme was orange gerberas and peach roses. 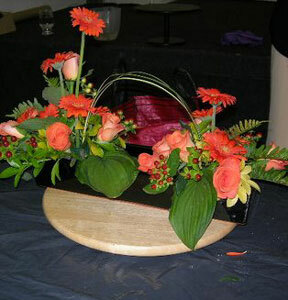 The final arrangement was traditional with a modern twist. The basis of this one was a shiny golden vase with deep pink gladioli rising in a stately fashion from the oasis taped to the top. Barbara then added greenery, purple larkspur, roses and alstroemerias. A truly fitting finale . 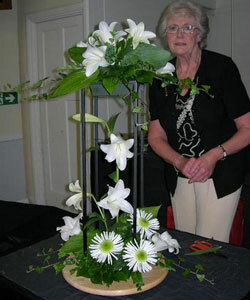 Barbara was an entertaining speaker, who threw out some interesting tips whilst creating her arrangements. Flower stems should always be cut at an angle preferably with a knife. A special foliage spray can be bought to give the foliage a healthy looking shine. Oasis, the basis of all the arrangements was invented about 50 years ago. It should never be used twice and it is now impregnated with plant food. Four lucky people each won an arrangement of flowers to take home. We don`t meet in August, and, therefore, the next meeting will be September 14th, when Lucy Reid will talk about "The Throckmortons of Coughton Court". This talk is open to visitors for a small charge of £2.